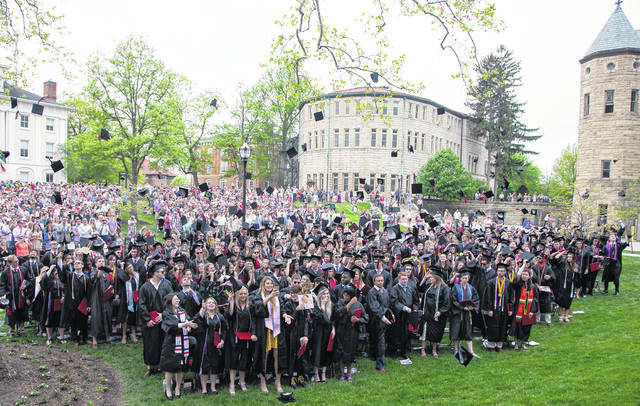 Ohio Wesleyan University celebrated its 174th commencement ceremony May 12. The OWU Class of 2018 includes 323 spring, summer and fall graduates. Ohio Wesleyan University’s 174th commencement ceremony, held May 12, was a day for celebrating accomplishments, for turning tassels and tossing caps, and for dancing like no one was watching. During his remarks, Schimmel, a genetic research and biotechnology industry leader, discussed how some of the nation’s vital medical breakthroughs have been achieved by thinking critically, by moving forward in the face of seemingly insurmountable obstacles, and by looking beyond current dogma and consensus. One such breakthrough, Schimmel said, was the development of a medication to treat infection-related sepsis, which has helped to save more than 300,000 lives in addition to hundreds of thousands of arms and legs that previously would have required amputation. During his career, Schimmel’s research has helped to support the development of new medicines, such as the sepsis treatment, and other biopharmaceuticals that seek to halt debilitating disease. His earlier work also helped to enable the human genome project in the 1990s. A pre-professional medicine major at Ohio Wesleyan, Schimmel today is the Ernest and Jean Hahn Professor of Molecular Medicine and Chemistry and a member of the faculty of the Skaggs Institute for Chemical Biology at the Scripps Research Institute. Also sharing words of wisdom with the Ohio Wesleyan graduates was Class President Madeleine G. Juszynski of Atlanta, Georgia. Juszynski discussed the opportunities created for the Class of 2018 while at Ohio Wesleyan and the group’s responsibilities moving forward. “Each of our professors worked to turn raw intellect into something more polished – into opinions that could be thoughtfully defended; into critical-thinking skills that allow us to engage with the world in a more mature way; into the ability to respectfully interact with members of other cultures. “Ohio Wesleyan graduates are prepared to take leadership roles in organizations that mean something to us, to volunteer for causes we care about deeply, and to step in where help is most needed,” said Juszynski, who majored in economics and minored in accounting and Mandarin Chinese. This fall, she will enroll at Vanderbilt University Law School in Nashville, Tennessee. President Rock Jones, Ph.D., also addressed the Ohio Wesleyan Class of 2018, stressing the need for the new graduates to serve as civic-minded leaders who help to address challenging issues throughout the world. “As you receive your diploma and leave this campus today,” Jones told the graduates, “you move forward into a world looking for leaders who bring us together in pursuit of a shared vision for a better life for all people; a world searching for leaders who bring to fruition the ideas that strengthen our economy and create a more just society; a world longing for leaders with the moral ballast to lead us to the best possible use of scientific discovery, economic development, big data, and intellectual achievement in a society that honors the dignity of every human being and of all creation; a world yearning for a message of hope and confidence at a time when too many voices sow seeds of division and fear. “Your education, grounded in the liberal arts and enhanced by experiences that connected you to the larger world and the pressing challenges that await your generation, has prepared you for just such leadership, in just such a world,” he said. The OWU Class of 2018 includes 323 spring, summer and fall graduates, with five members who achieved perfect 4.0 grade point averages: Colleen P. Chernowsky of Goodrich, Michigan; Abigail E. Connell of Hilliard, Ohio; Chloe E. Dyer of Guysville, Ohio; Meaghan J. Teitelman of Concord, Massachusetts; and Hope M. Walls of Delaware, Ohio. • James G. Peoples, Ph.D., professor of sociology-anthropology received The Bishop Herbert Welch Award for Scholarly or Artistic Achievement and also the Adam Poe Medal in recognition of his retirement after 30 years of dedicated service to his students and his profession. • Paul S. Dean, Ph.D., assistant professor of sociology-anthropology, received The Sherwood Dodge Shankland Award for Encouragement of Teachers. • Jeffrey L. Nunemacher, Ph.D., professor of mathematics and computer science, received The Bishop Herbert Welch Meritorious Teaching Award. President Jones concluded the 174th commencement ceremony with Ohio Wesleyan’s traditional benediction, encouraging OWU’s newest alumni to share their knowledge and compassion with a world in need. Ohio Wesleyan’s complete commencement ceremony is archived online at www.owu.edu/stream. Learn more about the event at www.owu.edu/commencement.